Analysis: The veteran wideout caught multiple passes for the first time in a month but still wasn't able to top 15 yards, something he hasn't accomplished since Week 11. With fellow receiver Mike Wallace (lower leg) having since been activated from injured reserve and potentially being available for the regular-season finale against Washington, Matthews' chances of making an impact might be even lower than usual. Analysis: While Matthews' role had been greatly reduced since the acquisition of Golden Tate, this marks rock bottom. The 26-year-old now has two goose eggs in the stat department over his last four games, with no more than one catch in any contest. He can safely be ignored in fantasy. Analysis: Matthews played just 11 snaps in this one and now has failed to surpass 14 in three of the last four weeks. He has just two catches for 10 yards over his last three games, although one was for a touchdown, and this week's was also a red-zone target. 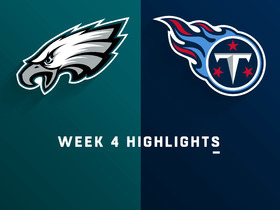 To play him on the road Week 15 against the Rams is to hope for another score and little more. Matthews caught one of two targets for a 4-yard touchdown in Monday night's 28-13 defeat of Washington. Analysis: Matthews caught a short pass on the second play of the fourth quarter and tumbled into the end zone for his first touchdown since Week 4. 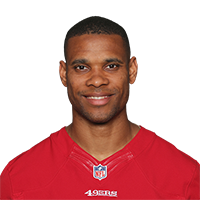 His 21 snaps in the contest represent a 50 percent increase over his past two games, but the 26-year-old still finished a distant fourth among receivers in terms of playing time. 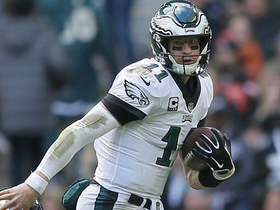 He remains a deep-league desperation play heading into a Week 14 matchup at Dallas. Matthews failed to catch his lone target in Sunday's 25-22 win over the Giants. Analysis: Matthews played only 14 of 65 offensive snaps, firmly finishing fourth among Eagles wide receivers. The 26-year-old has seen 14 offensive snaps each of the last two weeks, as the acquisition of Golden Tate has unsurprisingly cut into his already limited opportunities. Matthews did see more snaps than Tate in his first game with the team against the Cowboys, but he's now clearly the No. 4 option on the depth chart. Matthews caught three of four targets for 37 yards in Sunday's 48-7 loss to the Saints. Matthews played 37 of 62 snaps (60 percent) on offense in Sunday's 27-20 loss to Dallas, catching three of three targets for 40 yards, Dave Zangaro of NBC Sports Philadelphia. Analysis: Matthews held on to the No. 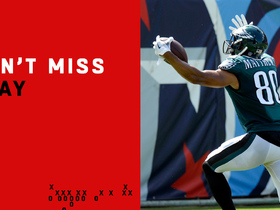 3 receiver job for at least one more week, as coach Doug Pederson wasn't comfortable using Golden Tate (18 snaps) when the Eagles went uptempo. It's only a matter of time before Matthews falls back to the fourth spot at wide receiver -- quite possibly as soon as Week 11 at New Orleans. Matthews stands to lose playing time as the result of the Golden Tate trade, Graham Foley of the Eagles' official site reports. Analysis: Matthews is probably the most negatively-affected Philadelphia receiver by this trade, as he's coming off a start that produced a season-high four catches for 93 yards in Week 8. The 26-year-old was barely playing half the team's snaps prior to the trade anyway and had no more than two catches in any of his five prior games this year. Any potential added fantasy value he seemed to be accruing just took a major hit. 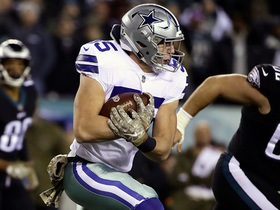 Dallas Cowboys linebacker Leighton Vander Esch picks off Philadelphia Eagles quarterback Carson Wentz on a perfect read. 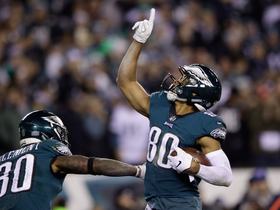 Philadelphia Eagles wide receiver Jordan Matthews catches for a 36-yard pass from quarterback Carson Wentz. 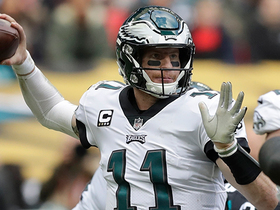 Philadelphia Eagles wide receiver Jordan Matthews brings down 13-yard pass from quarterback Carson Wentz. 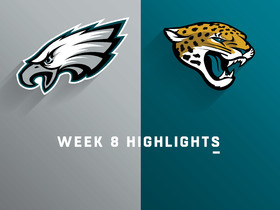 Philadelphia Eagles Carson Wentz finds wide receiver Jordan Matthews for a 25-yard gain vs. the Jacksonville Jaguars. 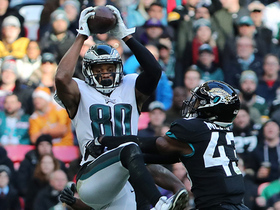 Philadelphia Eagles wide receiver Jordan Matthews breaks away from Tennessee Titans cornerback Malcolm Butler for a 56-yard touchdown for Week 4 of the 2018 season. 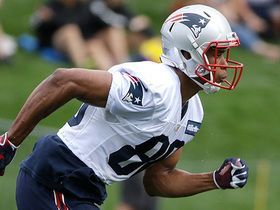 NFL Network Insider Ian Rapoport brings the latest information on the release of wide receiver Jordan Matthews by the Patriots.